In nearly my second month of in Alaska and many Alaskan adventures under my belt, I have to say that I’m loving it. Yes, the rain, mud, gear, and temperatures take some getting used to, but I’m acclimating quite well. As Alaskans say, it’s not bad weather, it’s bad gear. Thus, I have become a better gear traveler or just prepared like a Boy Scout. I have a waterproof backpack strapped on always and inside my gear: blue raincoat, pants, bike pump, tube, Swiss army knife, Iodine pills, water bottle, extra socks, nuts, camera, mini tri-pod, iPhone, and a whistle with thermometer and compass. They have all come in handy as either I solo explore the adventures in Alaska or with my Partner In Adventure, sometimes Crime (PIA or PIC). In fact, we have coined a term for explaining some of the natural beauty that we have witnessed on every hike, walk, float, flight, cruise, or drive. We have decided that we are living and exploring on “Planet Kermit.” Yes, in honor of our childhood friend, like many of you, we gave the name to this unbelievable green landscape to the lovable green frog, Kermit the Frog. 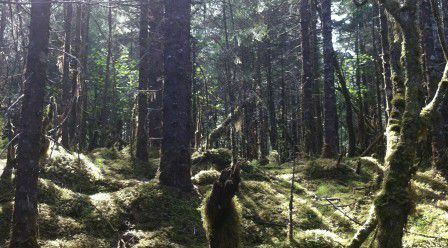 With all this rain that Southeast Alaska gets, the plants go insane and happily grow all over. The floor of the forest is covered by moss, the rocks covered by moss, the trees covered with moss, and shortly if I’m here long enough, I’ll be covered with moss. The plants also grow as if there are no limits. I have seen ferns and even skunk cabbages larger than a human and I don’t mean a short human like myself. With the vegetation gone wild on Planet Kermit, the forest seems to have a soundtrack. If it were possible it would be of growth with a side of waterfall. I tried to mirror what I would imagine the soundtrack to be in the video below highlighting many Planet Kermit sightings thus far. Follow my next Alaskan Adventure a la minute and/or wherever my next one may be via Facebook, Twitter, Google+, and/or YouTube. In nearly my second month of in Alaska and many Alaskan adventures under my belt, I have to say that I'm loving it. Yes, the rain, mud, gear, and temperatures take some getting used to, but I'm acclimating quite well. As Alaskans say, it's not bad weather, it's bad gear. Thus, I have become a better gear traveler or just prepared like a Boy Scout.